Here is a strange art work at the Museum of Modern Art (Museum Moderner Kunst - MUMOK), Ludwig Foundation, Vienna, Austria. 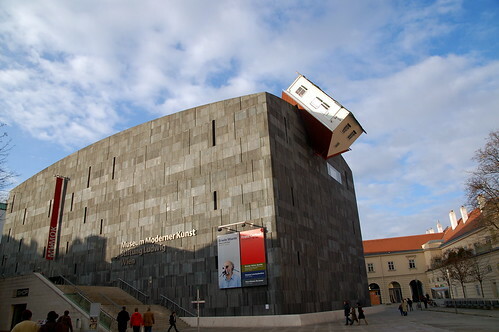 It was created by Austrian artist Erwin Wurm in October 2006 as part of exhibition of his works in the Museum from October 20, 2006 to February 11, 2007. 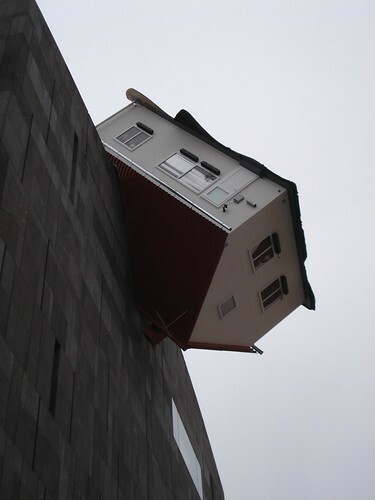 The artist had wedged a suburban cottage house into the Museum building and titled the art piece as "House Attack"
"In a spectacular event marking the opening of the exhibition Erwin Wurm. Keep A Cool Head, on October 18, 2006 House Attack a single-family house - was heaved onto the roof of MUMOK. House Attack will be on view for the duration of the exhibition. The idea for House Attack emerged while planning the MUMOK retrospective. 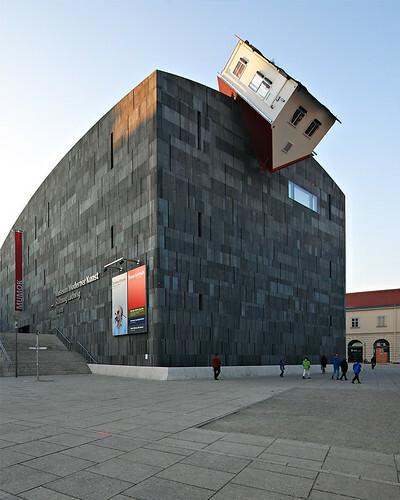 House Attack is a single-family house that crashes into the roof of the museum, a house like one that might be built at Blaue Laguene (Blue Lagoon), a prefab housing development in southern Vienna. A symbol for conservative, small-minded longings, the single-family house collides into the museum as an temple to the muses, and the museum itself now also becomes part of the sculpture. House Attack confuses our perception of art and everyday reality and in its striking appearance and humorous, dramatic staging of the banal is a perfect example of current developments in the artist's work." Image from Flickr is by Devan. 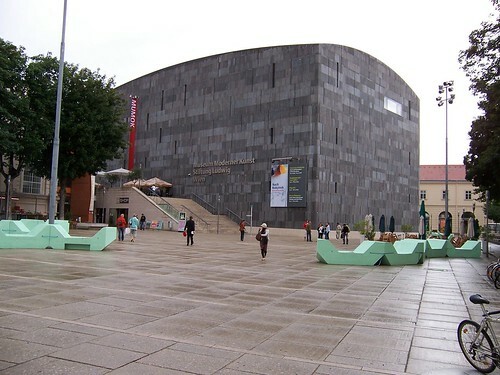 The art work which was temporary was removed at the end of exhibition, though many viewers had wished it to be permanent as they felt it had added zest to a rather dull museum building. Source of info: Official web site of the museum.